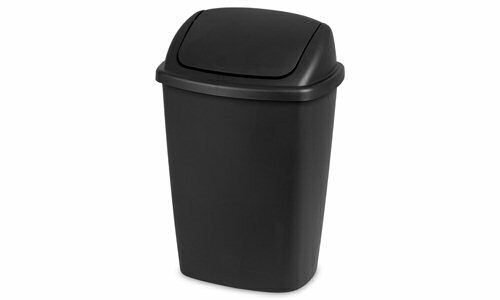 The 7.5 Gallon SwingTop Wastebasket is an ideal solution for bigger spaces and is great for use in the home or kitchen. It features an easy-to-clean textured surface and the SwingTop lid swings in easily when pushed. 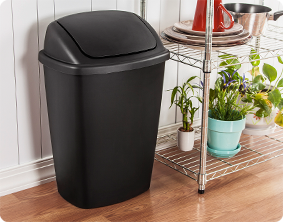 In addition, the wastebasket conveniently accommodates a standard 8-gallon trash liner. The combination of the polished and textured sides will add a fashionable element to any home décor. When the SwingTop wastebasket is closed, items are then concealed making for a more clean and organized look to wherever it is placed in the home, office or kitchen. The overall dimensions of this item are 14 5/8" L x 11 3/8" W x 21 5/8" H.
Overall Assembled Size: 14 5/8" x 11 3/8" x 21 5/8"
Ideal for use in the office or kitchen and features an easy-to-clean textured surface. 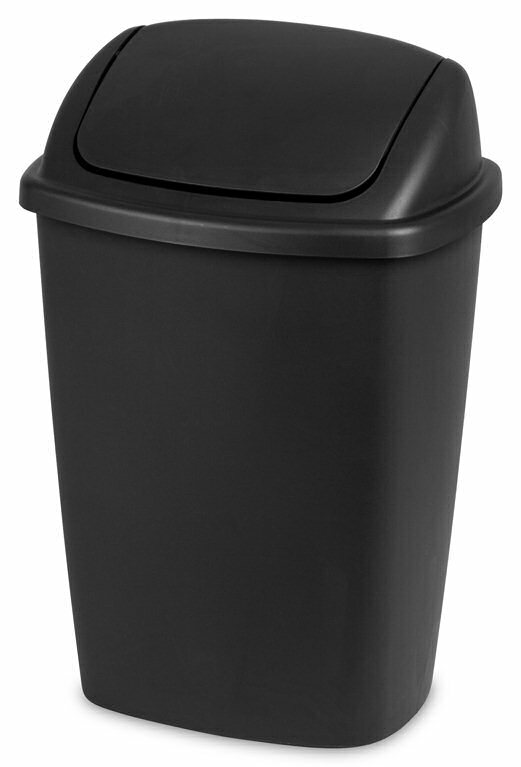 7.5 Gallon SwingTop Wastebasket is rated 4.7 out of 5 by 6. Rated 5 out of 5 by IamChellester from 7.5 Gallon SwingTop Wastebasket The 75 Gallon SwingTop Wastebasket is pretty nice! I recently purchased this for my kitchen, and it is working well. I normally find that most Sterilite products work the best for me. It is a trusted brand that I really use a lot of and will continue to do so. I love the wastebasket, it fits perfectly in the area I needed it for. Rated 5 out of 5 by tmpilk from Red 7.5 Gallon SwingTop Wastebasket This is the best wastebasket I've used because it is easy to put trash in. I also like that this wastebasket came in the color red since that is the accent color of my kitchen where I keep the wastebasket. Rated 5 out of 5 by hugsntugsmomreviews from Great Wastebasket In the past, I had tried wastebaskets with different types of lids and they would never shut nor keep stinky smells out. This wastebasket is perfect, stink stays in, I barely touch it to throw trash away and it doesn't look half bad in my kitchen. Rated 5 out of 5 by kyoung from great product Functional and durable. Would recommend. Doesn't totally block smells. But what does? Rated 5 out of 5 by Anonymous from Great for recyclables! I found this wastebasket to be perfect for recyclables! Looks great in the kitchen and works very good!